Today’s occasion in Mullingar is to mark International Day of Persons with Disabilities (Dec 3rd) and I am honoured as a member of Government to give the opening remarks at your conference. It is very important that International Day of Persons with Disabilities is recognised and supported and I want to thank everyone associated with today’s event here in Mullingar including the chair of Independent People with Disabilities, Mark Ahern and its secretary Michael Mulvey. I would also like to acknowledge the presence of Westmeath County Council Chief Executive, Pat Gallagher and the council’s disability officer, Annette Jordan. At the onset, I would also like to take a moment to remember the late Hugh Maguire from Athlone who one of the driving forces behind the organisation and who sadly passed away earlier in the year. 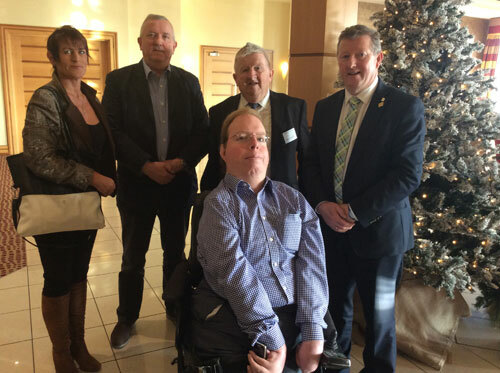 The Independent Alliance in their negotiations for Government insisted on a Minister in Government with sole responsibility for disabilities. History was subsequently made last May when Independent Alliance TD, Finian McGrath was appointed Minister of State for Disabilities who, in addition was given a seat at Cabinet. As you would have seen, the Programme for Government has made the issue of disabilities a major priority. With this in mind, we are currently reviewing the HSE Service Plan for Disabilities. The Independent Alliance have rejected the first draft of the plan and Minister McGrath is negotiating a revised final draft. The first draft did not go far enough. The plan needs to be more comprehensive addressing funding models for residential, respite and day care as the three core areas. I can assure you that the Independent Alliance will not sign off on the plan until we are fully satisfied with it. Historically, there has been a lack of investment in the disability sector and it is the Independent Alliance’s intention to rectify this situation. Of further concern is the fact that employment figures are very low for people with disabilities. We in the Independent Alliance under Minister McGrath aim to bring employment levels up to 4-6% of people employed. The Government remains strongly committed to proceeding to ratification of the UN Convention on Rights of People with Disabilities as quickly as possible, taking into account the need to ensure all necessary legislative and administrative requirements under the Convention are met. I would like to Minister McGrath and my Independent Alliance colleagues for their total support for the disability sector, including your local TD, Kevin ‘Boxer’ Moran who I know retains a very strong interest in the disability sector, both locally and nationally.